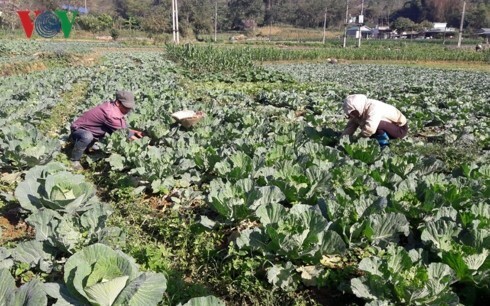 (VOVWORLD) - After more than 3 years of implementing an agricultural restructuring project, many production areas specializing in growing vegetables, flowers, and fruits have been created in Lai Chau City. They now provide enough farm produce for the city’s residents and have helped thousands of local farmers escape poverty. These days the family of Nguyen Van Quyet and other San Thang villagers in Lai Chau city plant high quality rice as soon as they harvested their winter-spring cabbage crop. In recent years, San Thang commune’s farmland is fully used. Whenever a rice crop is harvested, farmers plant vegetables or flowers. Quyet said fellow-villagers have pooled their experience in growing vegetables and flowers. A household can earn 21,500 USD per ha from flowers a year. “Our living conditions have improved since we joined the project at the city’s urging. We have enough water to irrigate all year round thanks to being near a ditch. From just 2 ha of vegetables, we earn nearly 1,300 USD per crop,” Quyet added. Since 2011, Lai Chau city has been following a master-plan that involves matching farm production to local conditions, applying new technology, and avoiding small-scale, scattered farming. The city has introduced policies that support changing crops and livestock to suit a new concentrated production model. At the same time, links between the State, scientists, businesses, and farmers have been strengthened to facilitate production, processing, distribution, and sales. Lai Chau city now has 310 ha of land for growing vegetables, flowers, fruit trees, and aquaculture. 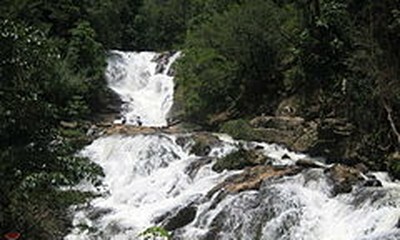 The development of specialized areas has helped ethnic minority people earn more than 1,700 USD per person per year. To ensure that local farmers have a stable income, Lai Chau city has called for greater efficiency, better environment protection, and food safety, use of technology geared to each region’s needs, and stable production of export products.